Disclosure: This visit was hosted, but all thoughts and opinions are my own. Recently on a rainy day, I ventured down to Anaheim for a special media day at Earl of Sandwich Downtown Disney. The media day was to taste their new Gyro sandwich (which I heard was delicious). I let them know I was vegetarian, and the chef at Earl of Sandwich was more than happy to make their two vegetarian lunch sandwiches for me: Veggie and Caprese. 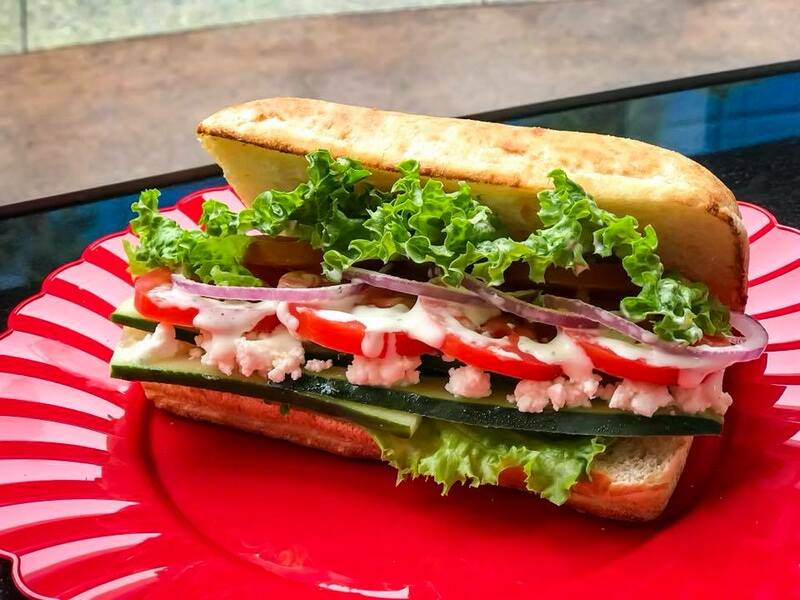 The Veggie Sandwich has feta, cucumbers, red peppers, red onions, lettuce, tomatoes, and a Mediterranean dressing. If you’re dairy-free, you can eliminate the feta and dressing, and ask to replace with a non-dairy dressing. I loved the crunch to this sandwich, and all the veggies tasted very good together! The Caprese Sandwich was by far, the best caprese sandwich I had ever had! The mozzarella was incredibly fresh, as well as the tomato and basil. The balsamic dressing on top is full of flavor, and of course combine that with Earl of Sandwich’s impeccable bread and toasted to perfection…so much yum! A friend of mine who is dairy-free said she often goes to Earl of Sandwich and orders this but substitutes avocado in place of mozzarella, still giving the sandwich that creamy texture and taste. In addition to their vegetarian lunch sandwiches, they also have vegetarian offerings for breakfast including an egg & cheese breakfast sandwich, oatmeal, yogurt parfait, and assorted muffins. On the kids menu grilled cheese (which is also delicious) and pizza bread. Something else they mentioned to me was that all their salads can be ordered without meat. They also have offerings of gluten-free soups and salads too! Another offering that is a bonus at Earl of Sandwich are their chocolate chip cookies. They were so incredibly tasty, and a must purchase if you’re visiting Earl of Sandwich. After tasting Earl of Sandwich Downtown Disney for the first time, I have returned a couple more times after that. It quickly became one of my favorite quick service restaurants at the Disneyland Resort! Seaside on the Pier in Santa Monica – Tasty, Fresh, and Vegetarian Friendly!